Literally, this song is unlike anything we’ve heard before. 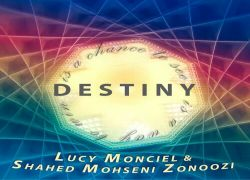 Between Shahed’s electronic beats and Lucy’s classical opera vocals along with her Duduk solos (an Armenian instrument), “Destiny” is a unique masterpiece. “Destiny” was performed for the first time during the Bringing Love show by InterContinental Concerts. Shahed (founder and producer of InterContinental Concerts) is an award winning producer with a huge appetite for world music, while Lucy Monciel is an established singer/songwriter with colorful music tastes and voices. Both of their dreams is to build a multicultural environment and worldwide acceptance of diversity through their music. The concept of their song is the universal theme of fate, that is whatever you decide to give will always come back to you somehow.